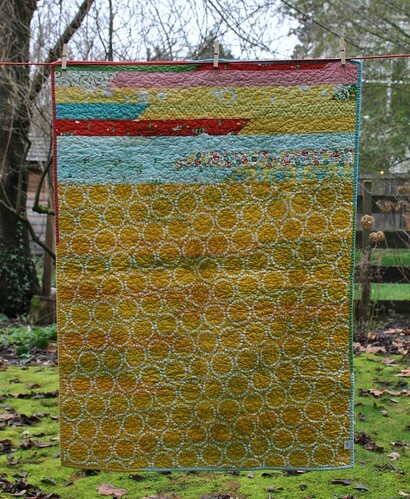 quilts, market bags, and auctions, oh my! While we were living in Seattle, Addy went to Catholic school. Like most private schools, Addy's school had a yearly auction to help raise money. 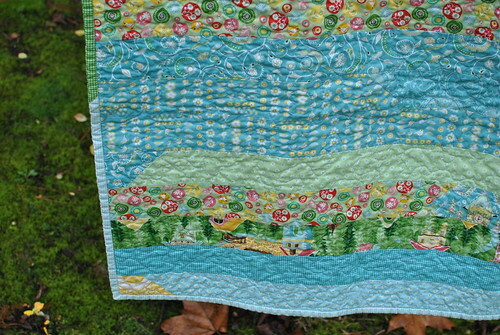 I think I mentioned *the* auction quilt in another post, but that will have to wait. Right now I want to show what our family contributed to the auction. I knew I wanted to make a quilt for the auction, but with a cross-country move looming in the near future, I needed something simple. 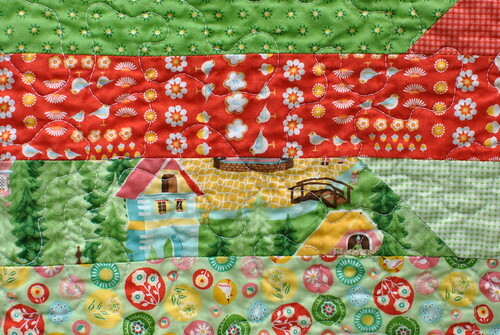 I stumbled on this idea, and decided to give it a shot with a jelly roll of Hideaway. The top was quick to piece (although I didn't come close to the record of 35 minutes), and I thought it made for a nice unisex baby quilt. I may try this technique again in the future, if I need a quick gift. 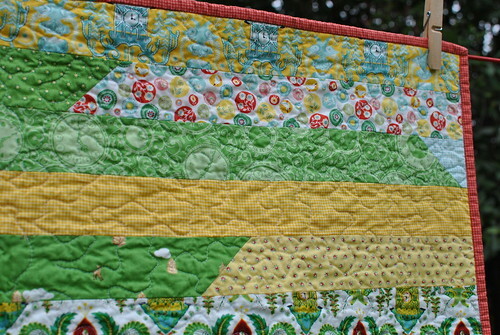 I quilted this in an all over meander and used 5 of the jelly roll strips for the binding. All of the different colored gingham prints worked great for that! 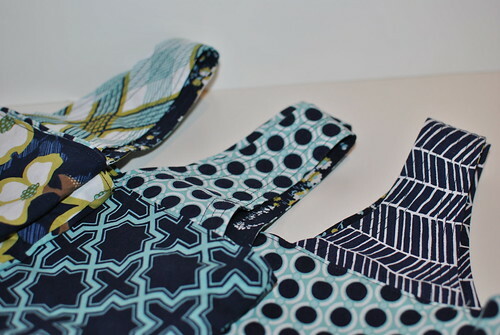 I really love this fabric line, each print is so fun! And the bright reds and greens paired with the pale yellows and blues work really well together. I adore the print featuring the houses. And that red print with the birds, that's one of my favorites. For the backing I used some leftover strips (I cut my top down to make a baby quilt rather than the lap quilt that 40 jelly roll strips yields) and the pearl bracelet from Lizzy House. 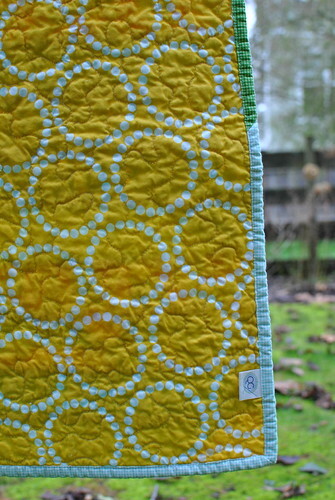 That print is such a great shade of yellow! It seems to go with just about anything. 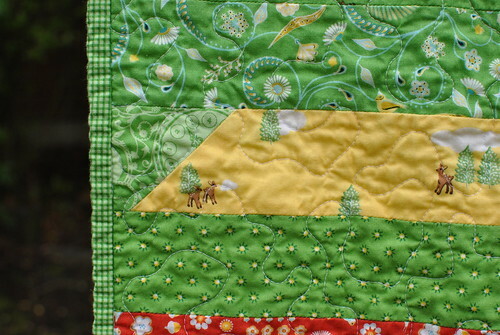 I finished the quilt by machine-stitching the binding and adding a label to the back. For the second item that our family donated, I made some market bags. Everyone in Seattle seems to already have reusable market bags, but who wouldn't want a coordinating set?! 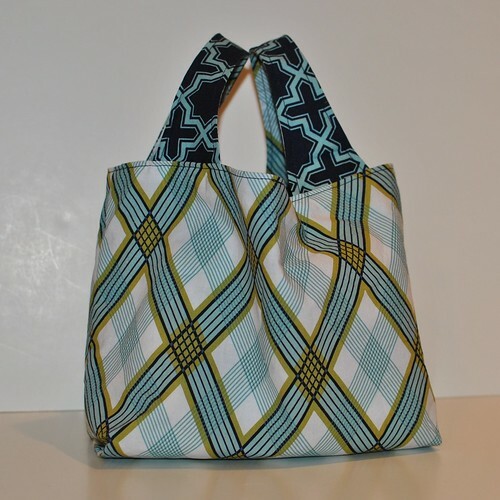 I followed the Reusable Grocery Bag pattern by Keyka Lou/Michelle Patterns. 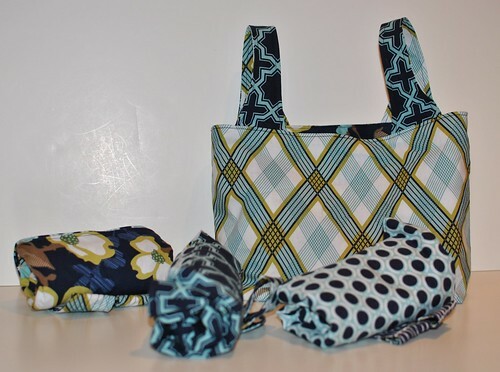 I made three regular size market bags plus a mini market bag that also stores the larger three bags when not in use. I used Joel Dewberry's Modern Meadow collection for these. I wanted something dark, to hide dirt and stains, and not too girly. I did have to use a few of the flower prints, so I tried to use them mostly for lining. I can't wait to hear how the auction goes this weekend. 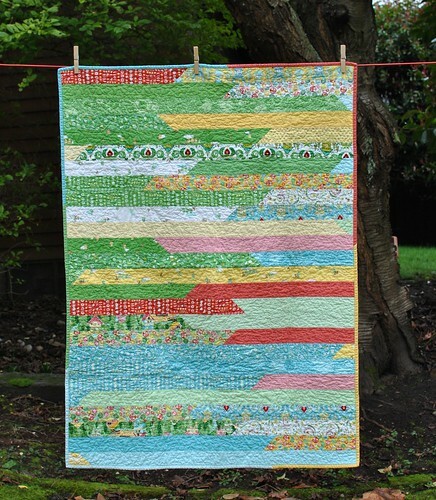 Hopefully by early next week I will have *the* auction quilt to share, along with details on how well it did!